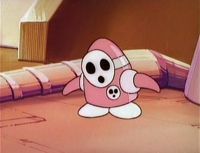 Robo Shyguys are robots that are modeled after Shyguys. They make only a single brief appearance in The Super Mario Bros. Super Show! episode "Robo Koopa". Robo Shyguys pose little threat, as almost any attack knocks one out. Robo Koopa orders several Robo Shyguys to keep Dr. Nerdnick captured in his own workshop in Robo Land. When Bunsen brings Mario, Luigi, Princess Toadstool and Toad to the workshop to rescue Dr. Nerdnick, they defeat the Robo Shyguys.